The Grawlix is the comedy super group comprised of Adam Cayton-Holland, Ben Roy and Andrew Orvedahl. Their live show combines their excellent stand-up with live sketches and video components. The Grawlix was formed in 2010 and rapidly took off, outgrowing several venues before settling down in Denver's historic Bug Theater. 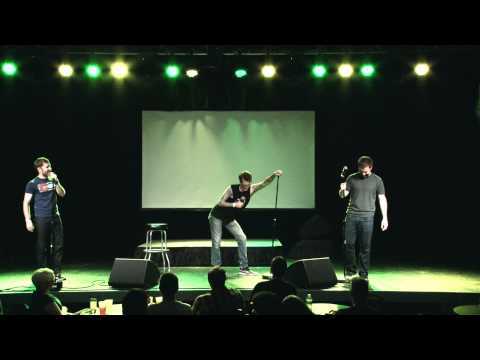 The group's current members, Adam Cayton-Holland, Ben Roy and Andrew Orvedahl brought entirely new material every month, which won them sold-out crowds show after show. They began to produce a video for each show, which grew into a web series and has since evolved into an original sitcom Those Who Can't which debuted on TruTV in 2016 and is currently airing its third season! The Grawlix is a mainstay on the festival circuit, having performed at Bridgetown, New York Comedy Fest, LA Riot, and SXSW among others. The group's members have a combined 37 years stand-up experience, and have appeared on Conan, Adam Devine's House Party, and The Tonight Show starring Jimmy Fallon.